Posted in: Home Improvement, Random Rants. That’s right. A 25″ gas and flint powered desk cannon capable of firing real ammo. And making a big boom. Nice. I recently “finished” my corner desk. I put finished in quotes because it really is not done. 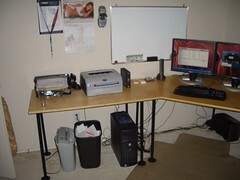 I began work on a side under desk cabinet to hold my PC, printer, and other accessories. It will be a open cabinet with a pull out tray for the printer. The base cabinet is done. I need to put in the bottom shelves, some structure to keep it from racking, the pull out shelf, and a brace or two to attach it to the desktop. I also need to poly it which will take a few days on it’s own. I should have this cabinet done next week. I am also going to build another cabinet for the right side of my desk to hold my router, hub, VoIP gizmo, and wireless AP. That will probably be a few weeks out. Speaking of cabinets. I am going to be working on some under cabinet lights for my kitchen soon. Hopefully this weekend. The plan is to tap into a power outlet to install a switch. Then I will run romex to two florescent tube lights, one on each side of the stove. Pictures if I don’t electrocute myself in the process. I’m booking my July trip to Mexico today. My good friend Brian is getting married at a resort south of Cozumel and it is time to get the hotel and airfare taken care of. This 4 day, 3 night adventure will cost about $700 inclusive. That seems like a pretty good deal to me. I cut a 4’x4′ section of the sheet of plywood to use as the corner desk itself. I notched the back for a cable drop and cut out the front to allow someone to sit at it. The edge of the front notch is 2′ wide so it will line up with the side desks. The side desks were simple. I took the left over plywood (a 4’x4′ section) and cut it in half. Unfortunately my spare bedroom/office required that I cut the left hand desk down a few inches to allow the door to close. The finish is a simply semi-gloss polyurethane. I sanded the bare wood desk smooth. I then applied 3 coats of poly sanding with 220 grit sandpaper between each coat. The legs are more complicated and quite a bit more expensive. I used 3/4″ black iron pipe which I found in the plumbing section of my local Home Depot. They have a cutting/threading machine there which I made good use of. The legs are 28″ long. This length requires cutting. I recommend getting all of the legs at the same time and using the 10′ pipe because you can get 4 legs from each pipe. HD has charges for cutting and threading- but both times I checked out I was not charged. Your mileage may vary. 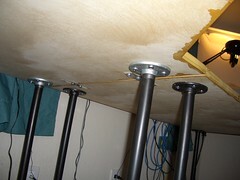 To attach the legs to the desk and to balance it on the floor I used 3/4″ thread galvanized floor flanges. They are expensive at about $3.50 each and you need a lot of them. I used 26 total. To make the legs look nice I used black Rust-Oleum paint. I had some in my garage and did not need to buy it for this project. Rattle-can paint would also work and might be easier. I just threaded bottom flanges and the legs together and painted two coats on. I painted the top flanges separate. 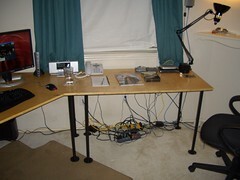 I moved the desk tops to the office along with the painted legs where I assembled the desk. The screw in design of the legs makes this really easy. It has the added benefit of being able to adjust the table top for differing leg lengths (they will vary a bit) and floor conditions. To attach the legs I used mending plates. These are small steel plates that are used to mend gates, fences, and the like. Span the joint with the plate, attach a few screws, and the desk is together. It is surprisingly stable once both sides were in. It was bit wobbly before that. I have not attached it to the wall in any way. 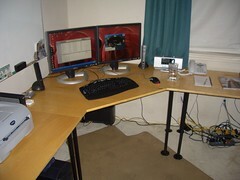 This allows me to run cables off the back edge at any point.